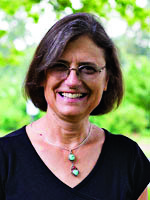 Sara Wenger Shenk ’71 serves as president of Anabaptist Mennonite Biblical Seminary, a position she began in fall 2010. Since coming to AMBS, she has overseen a “pivot of hope” program redesign, the hiring of seven new faculty, and a change of the seminary’s name. Her experiences in mission, church planting, teaching and administration fostered a unique combination of leadership gifts. She was a member of the faculty and administration of Eastern Mennonite Seminary, Harrisonburg, Va., for 15 years. For nine years, she and her husband, Gerald, served as students and teachers in the former Yugoslavia from 1977 to 1983 and 1986 to 1989. Sara has held Mennonite Church conference and denominational leadership roles. She has written extensively in both academic and church publications. “However one chooses to portray the distinctive qualities we as Anabaptist Christians exemplify, there is no doubt that we are increasingly being asked to bring the treasures of our story, communal spirituality, holistic discipleship, and missionary zeal as evangelists of the peace of Christ, into the broader public sphere. I am grateful for pastors, scholars, poets, artists, peacemakers, teachers, business leaders, builders, gardeners and healers who devote themselves to the deep formation needed to become leaders of God’s reconciling mission in the world.”, Shenk stated.